← Drake’s Treasure Found By Richfield? While researching my family for my book, I find myself in a huge power game. Meg Whitman bought 25 acres in SF, and I suspect she is going to build a business monument to herself to get back at Governor Gavin, who she lost to. Mega-Meg has formed QUIBI, and has all the major movie maker folks on board. I put forth my own movie ‘Helen of California’. I understand that the City has asked whether portions of 23rd Street owned by California Barrel Company (CBC) are subject to the public trust as tidelands and are thus under the jurisdiction of the Port of San Francisco (Port). As outlined below, this property is not subject to the public trust and thus not under the jurisdiction of the Port. Goddess of Victory atop the Dewey Monument- Alma Spreckels was the model. I have put my reluctant muse on a pedestal, and old smoke stack near the old Bohemian Barrel Company. Rena Victoria Easton is Britania, and the Goddess Victory. She is the heroine of my Bond book ‘The Royal Janitor’ and is Victoria Bond. To find Big Alma this morning is my Quest to capture the Beautiful Helen. Forgive me if I digress. Here are the other Greeks in the hunt. Here is Adolph Claus Spreckels who built a power plant. I am looking for where. An investor group backed by failed gubernatorial candidate and Hewlett Packard Enterprise CEO Meg Whitman just purchased a huge swath of land on the eastern edge of San Francisco, setting the stage for what could be a massive development in the Dogpatch. The Business Times reports that the property is the old Potrero Power Plant, a 21-acre site on the San Francisco Bay, and that the group Associate Capital purchased it for an unknown sum. The site’s previous owner, Houston-based NRG Energy, had recently been working with a different developer to create a plan for 3 million square feet of retail, open space, and housing. That deal obviously did not go through, although the reason for the failure is unclear. Where the property sits at 1201 Illinois Street is not that far from another huge proposed developed in India Basin. Developer Build Inc. intends to construct 1,000 condos on a plot of land just south of the recently purchased power plant. That project alone would have transformed the eastern side of the city, however if plans for the Illinois Street site are proposed (and approved) that resemble the now-discarded NRG Energy plans we could see an even more substantial change to an already bustling neighborhood. The Business Times reports that Associate Capital beat out ten other bidders for the site, and represents a new trend with large-scale developers. Specifically, Chris Foley of Polaris Pacific, a company that researches and markets condos, told the publication that the super wealthy are increasingly looking outside of the stock market and tech for places to put their money, and San Francisco real estate is an attractive proposition. That being said, approval for large-scale developments in San Francisco rarely comes easily. However, with Foley calling the lot “one of the last premier large-scale development sites in San Francisco,” we’re sure Associate Capital will try very hard to get it done. Following Pacific Rolling Mills, the City Gas Company Works, a forerunner of P.G.&E., was the next major industry to relocate to Potrero Point. Construction began in 1870 on “four blocks of land fronting the bay and lying between Humboldt and Sierra (22nd) Streets.” In 1873, the City Gas Company merged with the Metropolitan Gas Company and the San Francisco Gas Company to form the San Francisco Gas Light Company. In 1899 the company expanded its physical presence in Potrero Point by constructing a large power house, machine shop, meter house and purifying house on Humboldt Street to the southeast of the survey area (these buildings still stand). During much of the early 20th century, San Francisco Gas & Electric Company employed between 5 and 10% of Dogpatch residents. In 1881, prominent San Francisco industrialist Claus Spreckels purchased a five-block site on the south shore of Potrero Point, east of Louisiana and south of Humboldt Streets, and commenced construction of the California Sugar Refinery. The massive brick buildings which comprised the plant included the Melt/Filter House, the Wash House and the Char House. All were designed in 1881 by a New York architect named Hepworth. 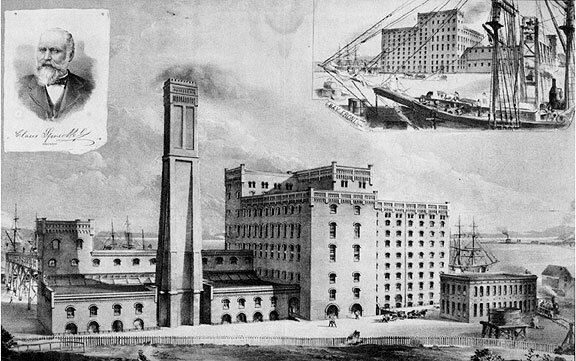 Western Sugar Refinery, n.d., near Union Iron Works, San Francisco. The California Sugar Refinery was purchased by the American Sugar Refining Company in 1891 and renamed the Western Sugar Refinery by its new owners. The refinery remained one of the top five employers in Dogpatch until the early 1950s, employing 1,000 men and between 10-to-15% of the neighborhood residents. In 1949, California & Hawaiian Sugar Refining Corporation bought the refinery and subsequently demolished the buildings and sold the machinery for scrap in 1951 after coming to the conclusion that the plant was too antiquated to be profitably modernized. Another early industry at Potrero Point was the American Barrel Company. First established at Potrero Point in 1884 on Louisiana Street, between Humboldt and Nevada Streets, the company was one of the earliest barrel manufacturers in San Francisco. In 1900 the factory was relocated to Sierra and Illinois Streets, where it remained in operation until 1956. The site is now occupied by a P.G.&E. parking lot. The character of Claus Spreckels is perhaps exemplified by this story: In 1895, Spreckels began construction of the Spreckels Building in San Francisco, and when completed it was the tallest building in the city. But Spreckels was annoyed because smoke from two plants of the San Francisco Gas and Electric Company were smudging the sides of the building and annoying his tenants. He asked the president of the utility, Joseph B. Crockett, to help reduce the soot, but was rebuffed. In answer, Spreckels in 1899 founded the Independent Electric Light and Power Company and engaged in a ferocious rate war with the older utility. The rate war and dogged competition forced the San Francisco Gas and Electric Company to merge with all of its rivals–except Spreckels who would not merge, but offered to sell his new company. The San Francisco Gas and Electric Company had no choice but to buy, at a handsome profit for Spreckels. The successor company of all these smaller companies is now the Pacific Gas and Electric Company! Claus Spreckels, of San Francisco, is a man of national and world-wide reputation, and his operations in industry and commerce place him among the noted Americans of this and the past century who by force of sheer industry, shrewd business ability and foresight and unexampled executive powers have assumed directing command of the commerce and industrial production of the world and wield a power and influence beside which the regal potentates and vain-florious military shiefs of the past were mere shadow puppets in the play of history. The life of Claus Spreckels is one of the interesting and absorbing personal histories of which America is so proud. He was born in Lamstedt, Hanover, Germany, July 9, 1828. At the age of twenty, in 1848, he came to Charleston, South Carolina, where he was employed in the humble capacity of grocery clerk, at small pay. Right here his genious for executive management and commercial control soon became apparent, for after a year and a half he bought out his employer with a promise to pay, and in one year was able to meet all his debts and have the store for his own. In 1855 he sought a larger field in New York city, where he established a wholesale and retail grocery. He soon afterward purchased a grocery business in San Francisco from his brother, and in June, 1856, he started for California. In 1857, he established the Albany Brewery in San Francisco, and after conducting both enterprises for a time, sold the store. His next concern was the establishment of the Bay Sugar Refining Company, but two years later he sold this and went to Europe to study more thoroughly the production and refining of beet sugar. While in Europe he entered a beet factory as a workman, and thus became familiar with all the details of the industry. He discovered that beet sugar could not at that time be manufactured in the United States with profit, and he accordingly returned to California and started the California Sugar Refining Company, which has grown to such proportions that it is now a landmark of San Francisco. Mr. Spreckels, in the course of some visits to the Sandwich Islands, was impressed with the possibilities of sugar-cane culture and leasing twenty thousand acres of land for his purpose from the government, he developed it and made cane-growing one of the foremost industries of those ocean realms. This enterprise not only profited himself, but was of untold benefit to the islanders, in recognition of which King Kalakaua made him a knight commander of the Order of the Kalakaua. Mr. Spreckels was one of the organizers of the Independent Electric Light and Power Company and of the Independent Gas Company in San Francisco, being the first president. With the immense fortune acquired through his varied enterprises he has been one of the most liberal men of California, and many public and charitable institutions have reason to be grateful that such a liberal and broad-minded captain of industry exists, not only as one of the pillars upholding the financial and industrial world of to-day, but as one who dispenses wisely the profits which his life of diligence and high ability have accumulated. As early as the 1880s, Claus Spreckels had become part of American, and then international, high society. However, with the exception of his interest in horses, in contrast to his children, he was never attracted by fancy or splendid passions. Instead, he was member in, and a supporter of, the Lutheran Church. In 1862, he offered a loan to St. Markus’s Evangelical Lutheran Church for purchasing land for its new church building. He donated regularly and whenever it was needed. For instance, the Schoenstein& Co. organ and chandelier from Germany, seen when the new St. Markus Church opened its doors in 1895, were financed by Spreckels.